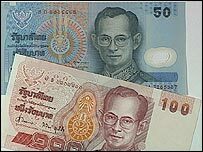 Thailand's central bank has denied it is planning to put a limit on the value of the baht, but has asked banks to avoid pushing the currency any higher. The banks have been asked to return their currency holdings to the position they were in at the end of 2006. The baht hit nine-year highs against the dollar last week but has since fallen back on rumours of intervention. But the Bank of Thailand's governor said on Tuesday that all the rumours about policy changes were unfounded. The central bank has taken a series of steps to deter currency speculators since last September's military coup. In December, the Bank of Thailand said that 30% of non-trade related foreign exchange sold for baht must be deposited interest-free with the central bank for a year.